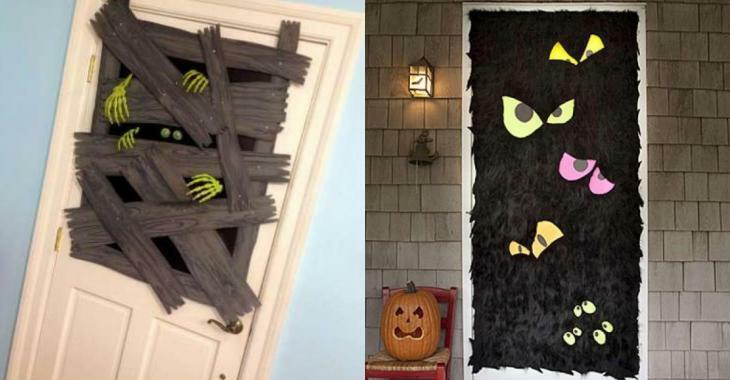 Crafts : 13 ideas to decorate your front door for Halloween! 13 ideas to decorate your front door for Halloween! It's not always easy to make beautiful Halloween decorations in front of the house. The larger the garden, the more difficult it is to evenly decorate the garden. But decorating the front door of a home is relatively simple and it's a good way to decorate the front of your home quickly and without spending too much. Check out these 13 ideas made with simple and inexpensive materials that you can find in every department stores or hardware stores. 1) Crepe streamer to decorate the parties, black and white construction paper and clear adhesive tape to make a mummy on the front door. 2) Cut bats in EVA foam (EVA foam is better than construction paper because it doesn't soften in the rain). 3) Black spider's web ! 4) Use a sharpie to draw eyes on EVA foam, then cut these eyes, and glue them on black faux fur. 5) White rope to make a giant spider web. 6) Use a wood grain paint tool, you can find these at most paint or craft stores. Just apply a very thick layer of paint on the wood and then dragg the tool across to create grain. 7) By cutting the neck of these styrofoam heads, you can make ghosts that float in the wind, use nylon thread (fishing line) to hang them. 8) Soak pieces of cheesecloth in water colored by a bag of black tea. Let it sit all night, it will look old because it will be yellowed. 9) A crime scene like in the very popular US series C.S.I. 10) A few brooms, a toad and witches shoes will do the trick. 11) Simple black construction paper to make gloomy shadows on the door ! 12) Giant jack-o'-lanterns ! They are scary !!! 13) And finally, skeleton heads fixed by raffia and decorated with various elements of Halloween ! Do you like all these Halloween decor ideas ? Share them !